8th of March, International Womens Day is actively celebrated in Kazakhstan every year since Kazakhstan became part of the USSR. And now, even after it's got its independence this holiday has still remained as one of the public holidays in Kazakhstan. Kazakhstanis' culture to respect women - mothers, wives, daughters and sisters make the importance of this holiday even stronger. Especially, the flower shops "blossom". The flower shops will experience some of their best days of the year days starting a few days before the 8 March. All women of any status either your collegues, your students, your acquiantances all female expect to be looked after. Men cook for their wives, moms and daughters whatever they can or take them to restaurants and concerts, or go outside the city for BBQs. 8th March starts off the spring in Kazakhstan having people warmed up for the upcoming Spring Holiday of Nayuryz on the 22th March. 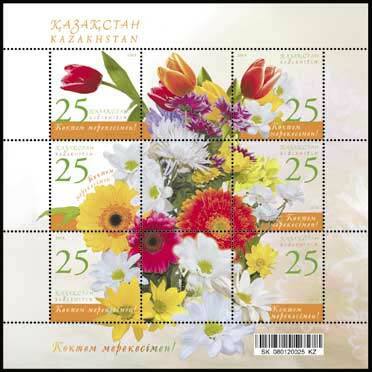 If you are abroad and want to send flowers to Kazakhstan, it's easy now. There are many websites that do just that.